I work in IT but I'm not really a gadget guy. I remember back in 2001 when my friend would call me every time he got a new phone (once a month) to tell me about all the new features his new phone had. If only the saying "Cool Story Bro" existed back then. At first it was just different wall papers, then ringtones and even a calculator! I think the Metallica ring tones were the best, anyone remember those? All of that aside, I am really amazed at how much mobile technology has evolved. I believe it was 2004 when I first saw a website loaded from a BlackBerry phone. It only took 10 minutes too! I remember thinking back then, this is stupid, there's no way a phone will be able to give users the same experience as a computer. That's where the getting full on my own words comes in. Before 2016, mobile devices surpassed computers for internet usage. You can see from the graph above, even though Street Source isn't 100% mobile friendly, most of the traffic still comes from mobile devices. When I bought the Street Source Magazine data in 2013, I was about half way through with building the application to replace phpBB for the Scene Sites (MazdaBScene.com, DuallyScene.com etc.). I won't go to into to much detail for this post but since then, I converted all data from the Scene Sites and Street Source Magazine to run in the new application. The application will never be finished so to speak. You could say it's like a project vehicle, you know always something but I would say it's more like doing a three stage paint job on an endless loop. For this loop, I'm going through all the code with the focus of making the entire site mobile friendly and adding some additional effects along the way. I'm going to push updates as I make progress so if you do happen to use any of the sites on a mobile device, you may encounter some pages not quite working right. 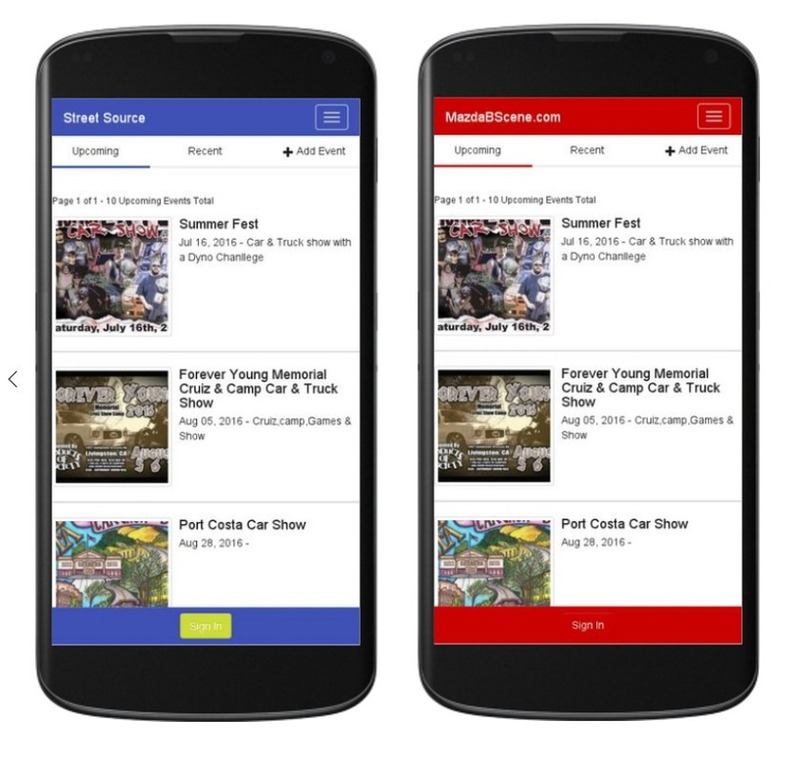 Here is just an example of the Upcoming Events page optimized for mobile and the application powering Street Source and MazdaBScene.com. More to come! This blog has been viewed 6451 times.